Our Pastor, Reverend Edward J. Healey was born, raised, and educated in Attleboro, Massachusetts. He graduated from Bishop Feehan High School in 1972. He received a Bachelor of Arts degree from Westfield State College in 1976 and a Master of Arts and Certificate of Advanced Graduate Study in Rehabilitation Counseling from Assumption College in Worcester in 1980. After working as a Service Coordinator for the Massachusetts Department of Mental Health in Taunton he entered St. John Seminary in Boston in September 1982. After completing the requirements for the Master of Divinity degree, he was ordained a priest for the Diocese of Fall River in 1987. Father Healey first served as a Parochial Vicar at St. Pius Xth Parish in South Yarmouth for six years before accepting an assignment as Priest Chaplain at Cape Cod Hospital in Hyannis. While serving as hospital chaplain Father Healey continued to serve the Hispanic Catholic Community of Cape Cod which he had helped to found in 1989 and would lead until he left Cape Cod in 1999. While serving at Cape Cod Hospital in Hyannis from 1993 to 1999 he was the first resident at St. Francis Xavier Parish in Hyannis until June of 1996 when he moved to Christ the King Parish and was resident here until his departure for Fall River in February 1999. From February 1999 to June 2005 Father Healey served as the Rector of the Cathedral of St. Mary of the Assumption in Fall River and as the Secretary for Community Services in the cabinet of then Bishop Sean P. O’Malley and the Diocesan Director of Hospital Ministry from 1998 until 2005. In 2005 Father Healey became the Pastor of Holy Trinity Parish in West Harwich. 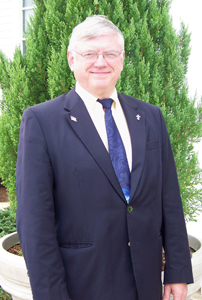 Deacon Robert D. Lemay was born and raised in Lowell, Massachusetts along with his brother and sister. After graduating from St. Joseph’s High School in Lowell he enlisted into the Marine Corps. In 1958 he married the former Joanne Nowak and together they raised three sons and a daughter. Deacon Lemay left the Marine Corps and completed a twenty-seven-year military career in the United States Coast Guard. Meanwhile, he began and completed his studies for the Permanent Diaconate for the Diocese of Fall River and was ordained by Bishop Cronin on November 6, 1982. He was assigned to St. John’s Parish in Pocasset and subsequently here at Christ the King in Mashpee. During this time, he pursued further studies at Bridgewater State College and received his BSW in 1989. He worked for the Department of Social Services in the Commonwealth of Massachusetts until his appointment as a full-time Pastoral Assistant at Christ the King Parish in November of 1993. He is the first full-time Deacon/ Pastoral Assistant in this diocese. Deacon Lemay is also the Diocesan Director of the Rite of Christian Initiation of Adults Ministry. In his spare time, he enjoys archery, fishing, and reading. He and Joanne enjoy traveling, particularly to be with their grandchildren. Contact through email. Deacon Frank D. Fantasia, a native of Watertown, Massachusetts, was educated in the Watertown public schools. Studied at Boston College, Chestnut Hill, Massachusetts where he received a B.S. degree in Economics with the class of 1964. Attended Suffolk University Law School, Boston, Massachusetts. Served in the Massachusetts Air National Guard from 1965 to 1971. In 1969, married the former Marie B. Alberico, also of Watertown and Boston College class of 1963. Together they raised a daughter and a son. Deacon Fantasia, a retired banker was employed in the banking industry for more than thirty years. He began and completed his studies for the Permanent Diaconate for the Diocese of Fall River and was ordained by Bishop Sean O’Malley on May 24, 1997. 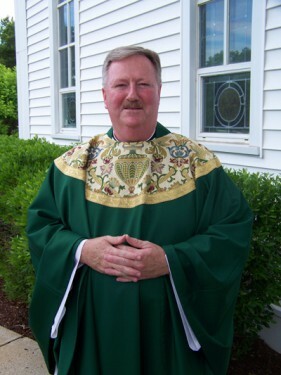 He was assigned to Elizabeth Seton Parish in North Falmouth and subsequently to Christ The King Parish in Mashpee. An avid automobile enthusiast, Deacon Fantasia also enjoys music, golf, and reading. Deacon Fantasia is an assistant director to the office of the Permanent Deaconate in the diocese and was also appointed by Bishop Coleman as a diocesan delegate to the 49th Eucharistic Congress that was held in Quebec City in June 2008. Contact through email. In Memoriam: Deacon Gregory J. Beckel, a native of Le Sueur, Minnesota, was educated at St. Anne’s Elementary and Le Sueur Public High School. Greg received a B.A. Degree in Sociology from St. John’s University, Collegeville, Minnesota, in 1969, and in 1993 attended Naval War College, Newport, Rhode Island where he received a Master’s Degree in National Security and Decision Making. Deacon Beckel spent 27 years in the Air Force and Massachusetts Air National Guard and retired as a Colonel. At the time of his retirement, he was the Vice Air Commander and Logistics Group Commander for the 102 Fighter Wing. In 1970 he married the former Elizabeth A. Ampe from Paynesville, Minnesota who graduated from Northeastern University with a B.A. in Music. Beth freelances music at various events, Greg was the Coordinator of the Confirmation Program, and along Beth was a Wellness Consultants. They have two daughters and a son. Deacon Beckel began and completed his studies for the Permanent Diaconate for the Diocese of Fall River and was ordained by Bishop Sean O’Malley on May 18, 2002. He was assigned to Christ the King Parish since his ordination. Deacon David Edward Pierce, born and raised in New Bedford, Massachusetts. He married the former Diane Vieira of Fall River in 1971. Diane and he live in Sandwich. They have two children, Michael and Jonathan, and two grandchildren, Luke and Betsy. David is a Deputy Director with the Commonwealth’s Division of Marine Fisheries and helps lead that agency’s involvement in all facets of marine fisheries management and science. David received his B.S. (1971) and M.S. (1981) in Marine Biology from UMass Dartmouth and his Ph.D. (1996) in Environmental Science from UMass Boston. He is an adjunct professor in the Department of Fisheries Oceanography at the UMass Dartmouth School for Marine Science and Technology (SMAST) where he teaches courses on Ocean Policy and Marine Fisheries Management – an arrangement through the Commonwealth’s Marine Fisheries Institute (MFI). Becoming a Catholic in 1994 and active in RCIA for many years, David later entered the Diocese’s Permanent Diaconate Program and was ordained in October 2007 when he was assigned to St. John the Evangelist in Pocasset and later served at both St. John and St. Elizabeth Seton in North Falmouth. David enjoys reading, traveling, backpacking, music, and writing. Diane and he love the companionship of family and good friends. He especially appreciates his transfer back to Christ the King where he worshiped with his family for about 23 years. Contact through email. Paul attended Northeastern University in Boston. He is an Independent Financial Planner and Advisor working with families, individuals, and small businesses. Joanne is an Assistant Elementary School Teacher in Falmouth. Deacon Harney completed his studies for the Permanent Diaconate of the Diocese of Fall River and was ordained by Bishop George Coleman on October 12th, 2013. Deacon Harney considers time spent with his family and friends to be precious but he also enjoys reading, tennis, hiking, golf, fishing, and boating. Contact through email. Director of Faith Formation and Youth Ministry, Kathy Laird is a native of Cape Cod having been born and raised in Falmouth. She graduated from Falmouth High School in 1985. She is a graduate of the University of Massachusetts, Amherst receiving a Bachelor of Arts degree in Elementary Education. She holds a Master of Education Degree in Literacy Curriculum, and Instruction from Lesley University. She has taught in elementary school for over nine years, both in public school and for the past four years at St. Pius X School in Yarmouth. In 1991 she was the recipient of the national Sallie Mae First Year Teacher Award sponsored by the Student Loan Marketing Association and the American Association of School Administrators. She was twice selected for inclusion in Who’s Who Among America’s Teachers, which honors 5 percent of our nation’s teachers yearly. In 1990, she married David Laird. Together they have three children: a son, Matthew and two daughters, Ashley and Hannah. She loves spending time with her family. She is a sports fan, enjoys reading and cooking and loves to listen to music. Click to email Kathy for Faith Formation or Youth Ministry. Director of Music, Donny Nolan Donny joined Christ The King Parish staff in the fall of 2006. His musical background is in arranging, orchestration, composition, and theory. He earned his master’s degree in arranging from the University of Miami, and, as a professor, taught courses at the college level for twenty-three years, twenty-one of them at Berklee College of Music in Boston, where he received the top teaching award in 1996. In addition to teaching, Donny gave arranging clinics around the country and helped to write part of the curriculum at Berklee. In 2004, Donny made a career change which took him to Atlanta Georgia. He became the Assistant Director of Music and Liturgy at Transfiguration Catholic Church. There, he directed the choir, played piano, and composed and/or arranged numerous liturgical works for the choir and instrumental ensembles. In October of 2006, Donny moved back home to Cape Cod where he was appointed Director of Music at Christ the King. Here, he directs the adult choir from the piano, organ, and digital keyboard for the 10:30 AM mass, in addition to accompanying the cantors for the 4:00 PM Saturday mass. Donny continues to compose music for the adult choir and accompany cantors for weddings and funerals. Contact through email. To contact any of our secretaries click to email.